On Purpose Journey Inc. has been working with the Admirals/Harley Davidson for years to honor Hometown Heroes–they always do an incredible job at making the events special for our service members and their families!! Many thanks to the Admirals and Harley Davidson for providing such wonderful opportunities for our service members!! Thank you to Paramount Pediatric Dentistry for such an incredible event and for honoring our military service members!! Donated this year was 1,000 pounds of candy for military and vets–that is a LOT of candy! Always an incredibly fun venue and we’re able to bring in some funds for shipping care packages overseas!! To everyone who contributes to On Purpose Journey Inc. through the United Way Greater Milwaukee and Waukesha Giving Campaign and the Combined Giving Campaign–thank you!! We need to purchase supplies to fill and ship more Morale Builder care packages overseas. 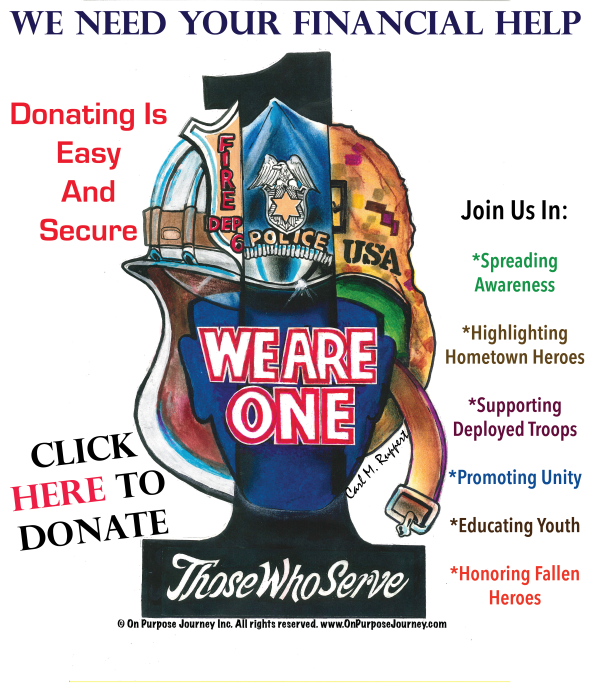 To see some funds come in to help with this mission is outstanding!! Just a shout out to everyone who has donated and those who continue to help us financially so we can fill and ship Morale Builder care packages overseas!! Your funds are bringing happiness to our heroes and we are forever grateful for your support!! Check out our Facebook page for updates and pictures (www.Facebook.com/OnPurposeJourney). You can shop online at AmazonSmile–the same as Amazon but it allows you to choose a charity to receive a donation based on your total cost–doesn’t cost you anything! AND On Purpose Journey is a preferred charity for AmazonSmile! Buy presents and make a difference for no extra cost! Have a wonderful holiday season and a Happy New Year knowing you’ve made a difference in the lives of incredible souls who serve! !